Hair No More guarantees super-fast, safe and painless hair removal. Using SHR technology – endorsed by leading medical experts – our equipment is the latest in IPL and laser hair removal, and targets unwanted facial and body hair. The result: smooth hair-free skin and a dramatic reduction in re-growth. ​How does IPL laser hair reduction work? The advanced treatment harnesses wavelengths of low energy light which are rapidly pulsed across the skin (180 times per minute), gently heating hair follicles and destroying them whilst preventing future re-growth. The procedure is quick, easy and painless as unlike traditional laser or IPL which use high energy levels that cause discomfort, Hair No More provides a pleasant warming experience. The post-treatment cooling function through the applicator (capable of -4°C) soothes and provides comfort in even the most sensitive areas. For best results we recommend a minimum of 6-8 sessions. 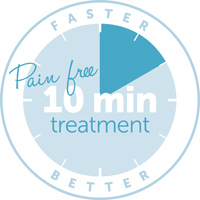 The highly effective, professional and painless hair removal treatment can take as little as 10 minutes and you’ll notice results after your first session.